Really summery, colourful, and quick to throw together. Wine Suggestion: the vibrancy of flavours demanded an equally vivacious wine; we chose the Kilikanoon Morts’ Block Riesling from the Clare Valley in Australia. It was dry and driven by a limey, textured presence that sang alongside this dish. Tip the couscous into a bowl and pour over the vegetable stock. Cover with some cling film and leave for 5 minutes. Mix the 125ml olive oil, the lime juice, garlic, mint & sugar together in a bowl to make a dressing. Fluff the couscous with a fork, stir in the chickpeas, then pour over half of the dressing. Mix well together and pile onto a serving plate. Heat 1 tbsp of oil in a large frying pan and fry the courgette slices for 2-3 minutes or until well browned. Remove with a slotted spoon and drain on some kitchen paper. Put the tomatoes into the pan, cut side down, for a couple of minutes until tinged brown on the cut side. Scatter the courgettes over the couscous, followed by the tomatoes. Heat a little more oil, then add the halloumi strips and fry for a couple of minutes or until brown on all sides. Pile the halloumi on top of the salad and pour over the remaining dressing. Our menus have featured a lot of meat recently so we’ve focused and had a few fishy weekends to redress the balance. This is another great recipe from Moro, really delicate and delicious. We followed their suggestion and served with a chickpea salad and saffron rice. A rare Saturday night treat for just the two of us; we made the full sauce but only used two cod fillets. Get started early as the rice needs to soak for a few hours. Wine Suggestion: a light, dry white wine with good flavour and texture is what we think goes best. We had a good Muscadet from Domaine de la Chauviniere which has a good depth of flavour despite it’s light body. Alternately a good Alvarinho/Albariño would be a good match too. Start by making the tahini sauce and the rice as the fish won’t take long at the end. Crush the garlic cloves with a good pinch of salt in a mortar and pestle until you have a paste. Transfer the paste to a small bowl and whisk in the tahini and lemon juice. Add the water until you get a sauce the consistency of double cream. Taste and season. Gently melt the butter in a saucepan. Add the cinnamon, cardamom pods and black peppercorns and fry gently for about 4 minute or until aromatic. Drain the rice and add to the butter, stirring to coat in the butter. Turn the heat up to medium-high and pour over enough water to cover by about 1cm, season with salt. Place a piece of greaseproof paper on the surface of the water, then cover, bring to the boil and simmer for 5 minutes. Remove the lid and paper and drizzle the saffron water evenly over the rice. Cover again with the paper and the lid, turn the heat to low and cook for another 4-5 minutes. You need to cook the cod on the hob first ideally in an ovenproof frying pan or failing that a roasting tray that can go on the hob. Add the olive oil to cover the base of the pan. Season the cod generously with salt and pepper, then place in the pan with the skin side up, keep shaking the pan all the time to prevent sticking. Cook for a couple of minutes to seal. Turn the fish over carefully and put the pan in the oven for 5-8 minutes, depending on the size of your fish. The fish is cooked when it is easy to flake and looks completely white inside. Pour the tahini sauce into the pan with the fish to warm for 30 seconds, then transfer to hot plates. Spoon the sauce over the fish and garnish with the parsley and pomegranate seeds. Serve with the chickpea salad, saffron rice & lemon. If you are travelling to Spain on your summer holidays don’t leave without picking up some dried chickpeas. It takes no effort to soak them overnight and they are far superior to the tinned variety (though of course you can use these instead if that’s what you have). Serve this delicious salad all summer with grilled meat or fish. Drain the dried, soaked chickpeas and rinse under cold water, then put into a large saucepan. Fill with 2 litres cold water and bring to the boil. Reduce the heat to a gentle simmer, skimming off any scum that builds up, and cook for 1-2 hours or until soft and tender. Take off the heat, pour off excess liquid until level with the chickpeas, and season well. Set aside. Put the garlic, chilli, onion, lemon juice, vinegar, olive oil, salt and pepper into a small mixing bowl. 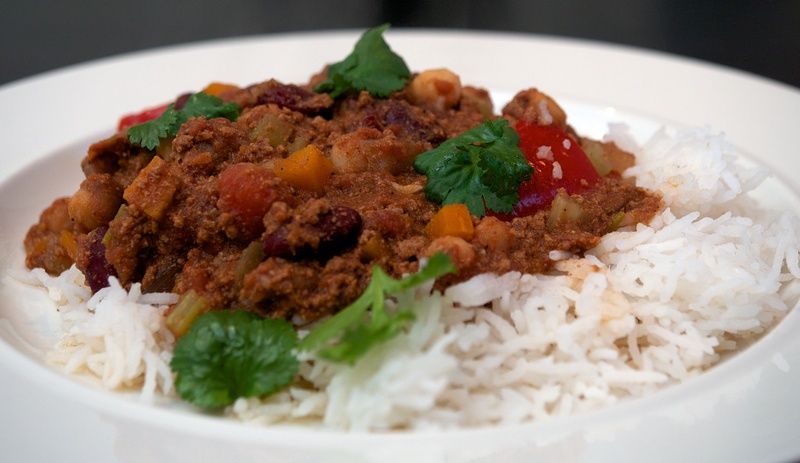 Stir well and add the rest of the ingredients – the drained chickpeas, cucumber, tomatoes, mint and coriander. Taste for seasoning and chill before serving. This is a super simple and fresh weeknight meal for two. 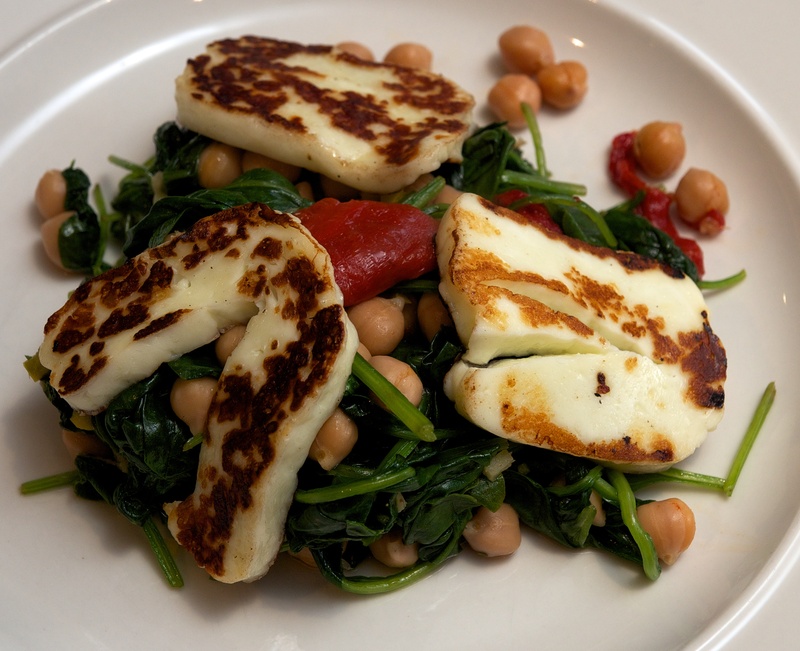 Halloumi cheese always feels like a bit of a treat. Heat the oil in a pan and gently fry the chilli and ginger for 1 minute. Stir in the chickpeas, spinach and peppers, then season. Cover and cook gently for a few minutes, stirring not and then, until the spinach has wilted and the chickpeas are warmed through. Meanwhile, heat a non-stick frying pan until very hot. Cut the halloumi into 6 slices and fry quickly for a minute or 2 on each side. Stir the lemon juice into the chickpeas and divide between 2 plates. Top with the halloumi and serve. We’ve eaten this as a side salad, and on it’s own with crusty bread – a summery meal in its own right! As always the quality of the tomatoes will really make this dish sing. You should assemble most of this dish a bit in advance to allow the flavours to develop, then add the herbs and feta cheese just before serving. Wine Suggestion: Try to find a youthful Italian red that echo’s the sunshine of this dish. We drank a Dolcetto d’Alba from Pira Luigi that had a joy and vitality, but reds from the Marche, Abruzzo and other central Italian regions should be a delight too. If you’re pushing the boat out go for a Rosso di Montalcino. Mix the tomatoes (including any juice) with the onion and chillies in a large bowl. Dress with the juice of 1½ lemons and lots of good olive oil. Season to taste. Heat the chickpeas in a pan, then add almost all of them to the bowl. Mush up the remaining chickpeas before adding them as well. Allow to marinate for a while at room temperature. Add the herbs and check the seasoning just before serving – you can add a bit more lemon juice if necessary. 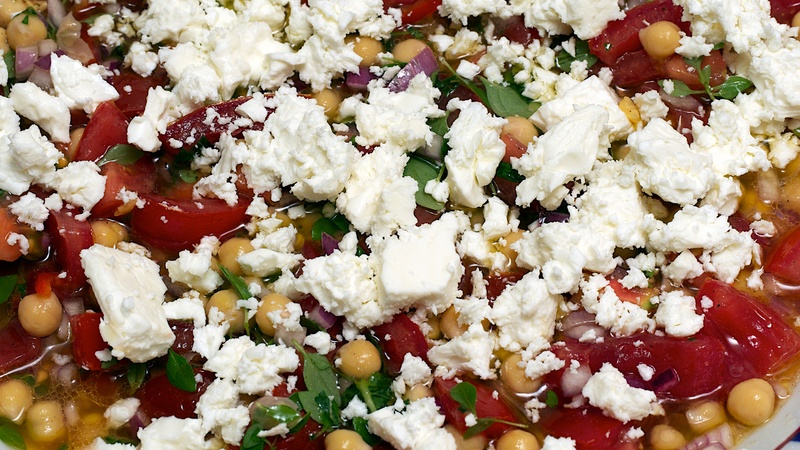 Put the salad in a serving dish and crumble the feta cheese over the top.